We take the hassle out of upgrading 401(k) service providers. Your Fisher Investments Retirement Counselor will be your single point of contact throughout the transition and on an on-going basis. You’ll get guidance at every step, and we’ll work with you to help ensure the implementation process is smooth and the 401(k) solution meets your company’s unique needs. We’ve seen a lot of different fee structures in the 401(k) industry. Take a peek at our guide to 401(k) fees. When you decide to move forward with Fisher Investments, the 401(k) Solutions service team will assist you with every step of the process. The FRA is the agreement between you and Fisher Investments. We will be available for any questions you may have throughout the review. 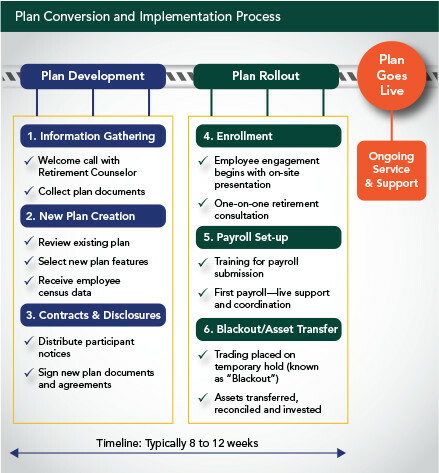 The Working Committee is a single individual or group that will participate in the conversion process for the plan, moving it from its current recordkeeper to the 401(k) Solutions platform at the new recordkeeper. The committee should include at least one authorized signer for the plan. A Retirement Counselor from Fisher Investments will be assigned to your plan, serving as your long-term point of contact. They will oversee all aspects of client service and help you get the most out of your plan. The plan's governing documents set the terms of the company's plan. Our partner service providers use this document to pre-populate their plan agreements, which serve as the design foundation for your plan. Our partners’ plan agreements list the features associated with your plan as well as contact information for all the parties involved (recordkeeper, third party administrator, trustee, etc.) After we receive the signed document from you, the conversion process begins. Your plan will be assigned a partner representative who, along with your Retirement Counselor, will guide the Working Committee through the installation process. We will schedule an installation call to discuss the plan agreement selections, make any changes or modifications at your request and discuss the next steps of installation. During the installation process, the Retirement Counselor and a team of professionals will conduct on-site enrollment and education meetings for your employees, explaining plan features and the importance of retirement planning in a fun, interactive way. They can be available to answer questions in a group or one-on-one setting.